With an exciting Thursday Night Football game in the books (especially for fantasy owners of Tom Brady and Rob Gronkowski! 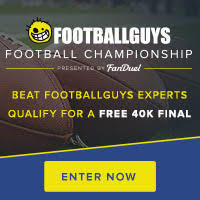 ), we turn our attention towards the remaining 15 games on the slate for Week One - the Footballguys have already delved into the players available at FanDuel in the remaining contests and have come up with their Sunday Cash Plays lineups (scroll down past the Thursday entries for the Sunday set of selections). As Andrew Garda noted on the Staff Thursday Cash Lineups, Sam Bradford ($7,500) is a popular pick at quarterback this week heading for the Georgia Dome and a presumed shootout with Matt Ryan. However, Tyrod Taylor ($5,00) and Ryan Tannehill ($8,000) both have two adherents heading into the Sunday/Monday contests - Maurile Tremblay and Danny Tuccitto have Taylor locked and loaded while Justin Howe and Chad Parsons are Tannehill advocates. Three staffers are out on lonely limbs with Phil Alexander going with Aaron Rodgers ($9,700), Jeff Pasquino tapping Tony Romo ($8,700) and yours truly (Mark Wimer) electing to start Jameis Winston ($6,900) vs. the horrible Tennessee secondary. Equally interestingly, the other half of the presumed PHI/ATL shootout, Matt Ryan ($8,800), has zero staffers starting him this week. Also drawing zero interest this week - last year's rushing champion DeMarco Murray ($8,500). Which Eagle receiver will soar? With 50% of the FanDuel Staff Cash Play lineups featuring Sam Bradford as the quarterback, the consensus seems to be that Jordan Matthews ($6,800) is the receiver to stack with Bradford - four of the Bradford owners are employing this duo, and Matthews also appears on three other lineups that don't have Bradford in as the starting quarterback. Nelson Agholor ($5,500) is only stacked with Bradford once and only appears on one other lineup across 14 staffers. Brandon McManus ($4,500) appears on a whopping 10 out of 14 Sunday Cash Play Lineups - as Jason Wood explains: "Broncos cut Barth and kept McManus, making him a min salary kicker with top 3 scoring upside in Week One." With the anemic Cleveland passing attack on the menu for the Jets' pass defense ($4,400) in Week One, nine staffers have plugged in that defense for the lineups. But not everyone is going that route - Miami ($4,700) has two admirers (Dan Hindery, Jeff Pasquino); while Carolina ($4,800-Mark Wimer), Kansas City ($4,300-Justin Howe) and Dallas ($4,200-Jeff Haseley) all got one staffer to plug them in. For the latest takes on Buffalo's LeSean McCoy/Karlos Williams, Chicago's Alshon Jeffery, Detroit's Joique Bell, Tampa's Mike Evans, St. Louis' Tre Mason, and MORE, click on the two links above for in-depth analysis of each individual situation before throwing one of the above known-to-be-injured/rehabbing players into your Daily Fantasy lineups for Week One. These two reports are invaluable resources for people interested in Daily Fantasy Football. Enjoy all the NFL action this weekend, friends! Pro Football is BACK! HOORAY!!! This is unrelated to this article but I have a question regarding fan duel league plays. I've found those top 3 5 man leagues where 60% of field pays. How does that compare to 50/50 cash games. Is it worth it considering you only have to beat 40% now or will the payouts for 2nd and 3rd be too small that you get eaten up by rake. Thoughts? I have read your articles for years and believe you guys are world class. Your insight won me thousands last year while grinding low entry 50/50. I appreciate it and just want to keep improving my game to stay ahead. Other fear is that smaller pool increases shark percentage but so small payoff would probably limit that due to the 1k entry limit. Thoughts? Field too small? Rake too high? Or good idea? My experience so far is that entries at/under the $5 level are not "too sharky" while those above $10 get increasingly challenging as the cost goes up. Given that there are many entry fee price points at FanDuel, my response is that if you want to stay in a relatively shark-free environment (if there is such a thing since we published "Cracking FanDuel" ;-) ) I would stay at or under $5 entry fee and play as many of those contests as I am comfortable with in any given week, given my bankroll. There are several excellent articles on Footballguys.com about how to manage your bankroll effectively without getting wiped out in any given week.